The series Studia dipterologica Supplement publishes dipterological monographs of more than 100 printed pages. This gives dipterists the possibility of publishing large original papers on the Diptera. 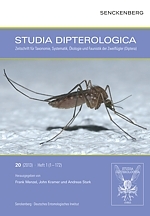 The scope of the Studia dipterologica Supplement series is the same as for Studia dipterologica. The principal requirement is for comprehensive revisions, identification keys, complex regional faunas, check lists, taxonomic catalogues, collection holdings, type catalogues, bibliographies and also theoretical and historical contributions that concern the Diptera. This includes all papers of a monographic character from the fields of taxonomy and phylogenetic systematics, comparative morphology, zoogeography, ecology and applied dipterology. The series Studia dipterologica Supplement also publishes university theses on dipterology that have received a minimum grade of "good" from their assessors. Dipterological monographs can only be published at present with a financial contribution from the author(s). The publishers will prepare a detailed estimate of the costs and marketing possibilities. This will be based on the size of the manuscript, the print-run required, and the estimated retail price. Studia dipterologica Supplement will appear at irregular intervals and will have the same format as the journal Studia dipterologica (17 cm x 24 cm). The instructions for authors are the same for the Studia dipterologica Supplement as they are for the journal Studia dipterologica. Subscribers to the "Studia dipterologica" are offered monographs of the Studia dipterologica Supplement at a reduced rate (see the price list). A subscriber to the Studia dipterologica does not have to subscribe to the Studia dipterologica supplement. Individual supplementary volumes or the whole series, as required, can be delivered upon receipt of a written order. Every subscriber to the "Studia dipterologica" is entitled to receive one copy of each volume of the "Studia dipterologica Supplement" at a reduced rate.